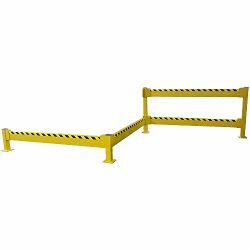 The Structural Barrier Rail (SBR) is a heavy duty guardrail system used in a variety of applications, including but not limited to: forklift battery changing area, personnel walkway, warehouse racking, modular office, machinery, vehicular passageway, safety equipment, and bollard replacement. The SBR is configurable to maximize protection and prevent accidents. A small investment in barrier rails could prevent big losses due to accidents and injuries. Contact our sales team at +1 314 423 2075 to learn more about how Structural Barrier Rails can make your warehouse more safe and compliant with OSHA regulations.